To traverse any sort of great distance in the years preceding the advent of the automobile was no easy task; indeed, the means of transport were few, and the access to such means was limited. Putting a finer point on things, we can safely say that before the automobile descended upon a the United States, annihilating distances and transforming the landscape, personal human travel was confined to reliance upon animal and foot power, and obviously, the going was slow. So it is with the difficulty of mobility as the backdrop that we can better understand the stunning rise of the bicycle in late 19th century America. The bicycle that we know today--pedals for propulsion, air-filled tires on two wheels of a uniform size, did not spring forth fully formed and ready to ride. Instead the early cycles (circa 1815) were strange little contraptions indeed, little more than novelty items for Europe's leisure class, these wobbly wooden conveyances required the rider to push off from the ground to move and maintain any sort of speed. This inefficient curiosity was to receive a new burst of potential with the advent of the pedal in France in the late 1860s. While pedal propulsion was an important innovation, the cycle still remained impractical for long distance pursuits, and by 1870, few machines were to be found outside of junk piles. (Smith, 7). A series of innovations beginning in 1871 with the invention of the British high-wheeler or "ordinary" were to bring the bicycle one step closer to becoming a practical mode of transportation. The high-wheeler employed a number of modernisms that would become mainstays of the cycle, including rubber wheels, and an iron--as opposed to wooden, frame. The British high-wheeler made its debut in the United States at an exhibition in Philadelphia in 1876, and while the machine fascinated numerous passers-by it encouraged one man, Albert Pope, to commission the first bicycle to be built in the U.S. The bicycle, Pope claimed, was an "ever-saddled horse that eats nothing and requires no care. "(Dodge, p. 72). A tireless promoter, Pope was intent upon securing the cycle's popularity by any means necessary, including founding magazines to editorialize upon the benefits of cycling, paying doctors to praise the effects of regular cycling and setting up a national distribution network operating upon a fixed price doctrine, so his Columbia bicycle cost the same anywhere in the country. 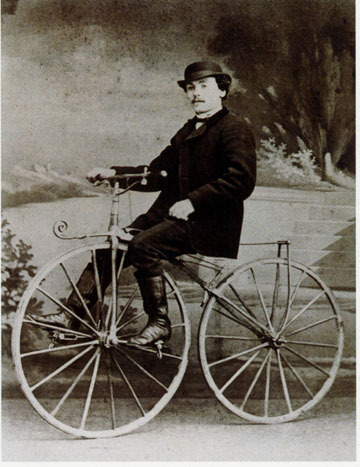 The bicycle was quickly becoming more available, more useful, and maybe even beneficial to one's health, (depending upon whom you asked) but it was with the advent of the safety bicycle in the 1880s that the bicycle would truly become an American craze.